As is well known Utah is currently considering a bill promoting creationism. But they also have a bill affecting archaeology in the works. This is HB 139. I haven’t had a chance to digest the entire thing yet but it looks kind of goofy. An alert Reader sent me a link to this story on the bill. Chad Orzel over at Uncommon Principles has assigned more home work. He wants to know your least favorite misconceptions about your field. When I signed up with ScienceBlogs I didn’t realize there were going to be mid=terms! My first annoying misconception actually concerns the uncertainty pricnciple. You see it is often invoked, within the field of cultural anthropology, as a criticism of field work – usually by those with post modernist leanings. People argue that the observer has unknowable effects on the observed, consequently any attempt at scientific analysis is tossed out the window. It is undeniable that the observer has effects on the observed. There have been a number of cases where an informan tries to use the relationship with the ethnographer to elevate their social status, for example, but the PoMo abandonment of science has led them into a bit of a rut. Tiesler discovered the slaves’ remains buried in a colonial- era graveyard that was unearthed in 2000 during a remodeling of Campeche’s public square. The remains are from the late 16th century and the mid-17th century. 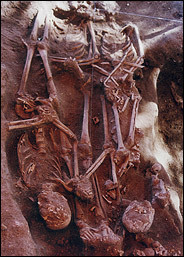 In the Campeche graveyard, Tiesler and other archaeologists found individuals of a number of different ethnicities, including Amerindians and Europeans. They were also surprised and perplexed to find remains that appeared to be of African origin. Some of these latter individuals appeared to have teeth which had been filed, a decorative practice common in Africa. 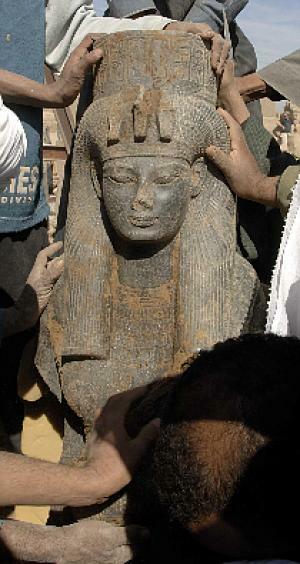 “The statue, however, when it was removed, revealed itself as a queen of Amenhotep III, whose name appears repeatedly on the statue’s crown,” Bryan said. She said she theorizes that perhaps this statue is of the great Queen Tiy, wife of Amenhotep III and mother of the so-called heretic king Akhenaten, who came to the throne as Amenhotep IV but later changed his name because of his rejection of the god Amen in favor of the sun disk Aten. Via Anthropology in the News comes this interesting story. What is so interesting about it you ask? “He is holding a 26-centimeter dagger and appears to be making a forward thrust,” said archaeologist Ali Mahforuzi, who led the excavation at Gohar Tepe, where the skeleton was found. Gohar Tepe is located in northeastern Iran near the town of Behshahr and the Caspian Sea. 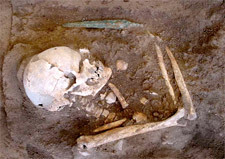 “Beside the skeleton, a number of dishes have also been found which seem to have been presented to the warrior,” Mahforuzi said. “One of the dishes has some holes in it containing the remains of coal. 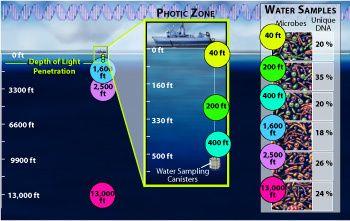 The interdisciplinary research team sequenced a total of 64 million base pairs, or subunits, of DNA from microbes and viruses they collected at each depth. In the process, they discovered thousands of new genes from novel and ecologically abundant microbes and found evidence of frequent gene exchange between organisms. The study also revealed variations in genetic composition at different depths–including differences among genes involved with carbon and energy metabolism. Microbes near the ocean surface, for example, had more genes devoted to taking in iron, a major element necessary for growth in that zone. Genomes from organisms below the ocean’s deepest and darkest layers displayed almost epidemic levels of DNA associated with “jumping genes,” or pieces of DNA that can move from one part of the genome to another. Added Later: krauze is claiming some sort of conspiracy about the poll he sent out. So let me clear it up for him, we did not receive marching orders from Elsberry. The response was the same because we all recognize a poorly designed survey (you didn’t mention choice H: ‘Intelligent design’ is a subset of the arguments previously labeled ‘creation science’ in your post, by the by) when we see one. Perhaps you should take a class in survey design…. Anyway, I was watching Ghostbusters when some of the odd wording of the survey popped into my head. You have been contacted because you contribute to a blog which has been identified as a “pro-science blog”. If Krauze is saying I am pro-science and an ID outsider, doesn’t that imply that Krauze thinks ID is not pro-science?